WAITE: Whatsoever is intimated by the design [see illustration, left]; also pain, affliction, tears, sadness, desolation. It is not especially a card of violent death. Additional Meanings: Followed by Ace and King, imprisonment; for girl or wife, treason on the part of friends. Reversed: Advantage, profit, success, favour, but none of these are permanent; also power and authority. Additional Meanings: Victory and consequent fortune for a soldier in war. MATHERS: Tears, Affliction, Grief, Sorrow. Reversed: Passing Success, Momentary Advantage. ETTEILLA: Affliction, Tears, Crying, Sobs, Groans, Sighs, Moans, Lamentations, Complaints, Ailments, Grief, Sadness, Distress, Jeremiad, Lay [Poetry], Desolation. Reversed: Advantage, Gain, Profit, Success.Favor, Gift, Kind Deed, Influence, Ability, Empire, Authority, Power, Usurpation. 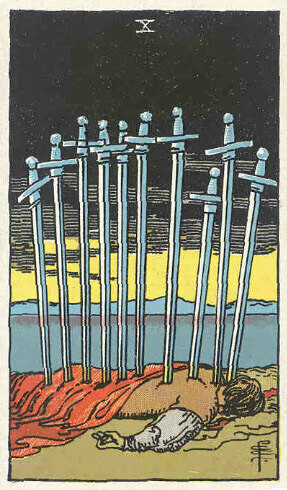 Illustration (above): Ten of Swords, from an early edition (c. 1910) of The Rider Tarot Deck by Waite & Smith, first published by Rider in 1909 (from the private collection of Holly Voley.) Click the image for a larger one. WAITE: Death, failure, miscarriage, delay, deception, disappointment, despair. Additional meanings: An ecclesiastic, a priest; generally, a card of bad omen. Reversed: Imprisonment, suspicion, doubt, reasonable fear, shame. Additional Meanings: Good ground for suspicion against a doubtful person. MATHERS: An Ecclesiastic, A Priest, Conscience, Probity, Good Faith, Integrity. Reversed: Wise distrust, Suspicion, Fear, Doubt, Shady character. ETTEILLA: Unmarried Person, Virginity, Abbott, Priest, Monk, Hermit, Religious Person, Temple, Church, Monastery, Convent, Hermitage, Sanctuary.Cult, Religion, Piety, Devotion, Rite, Ceremony, Ritual.Cloistered Person, Anchorite, Vestal Virgin. Reversed: Justified Mistrust, Justified Suspicion, Reasonable Fear, Misgiving, Doubt, Conjecture.Scruple, Troubled Conscience, Innocent, Timidity, Propriety. Disgrace, Shame. WAITE: Bad news, violent chagrin, crisis, censure, power in trammels, conflict, calumny, also sickness. Additional Meanings: For a woman, scandal spread in her respect. 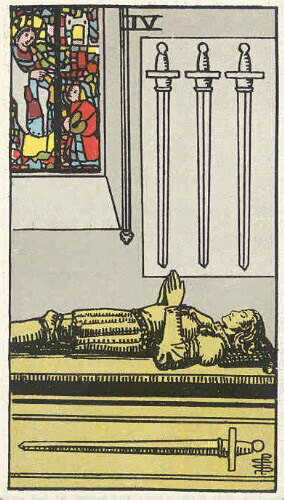 Reversed: Disquiet, difficulty, opposition, accident, treachery; what is unforeseen; fatality. Additional Meanings: Departure of a relative. MATHERS: Sickness, Calumny, Criticism, Blame. Reversed: Treachery in the Past, Event, Accident, Remarkable Incident. ETTEILLA: Criticism, Regrettable Situation, Critical Moment, Critical Time, Decisive Moment, Unfortunate Situation, Delicate Circumstance, Crisis.Examination, Discussion, Investigations, Blame, Censure, Commentary, Conclusion, Monitoring, Disapproval, Condemnation, Abrogation, Judgment, Contempt. Reversed: Incident, Difficulty, Exceptional Situation, Conjunction, Event, Accessory, Unconscious, Obstacle, Delay, Waiting.Abjection.Dispute, Contradiction, Opposition, Resistance, Squabble.Unexpected, Unforeseen, Fortunate Occurrence, Destiny, Fate, Accidents, Misfortunes, Disgrace, Unfortunate, Symptom. WAITE: Design, attempt, wish, hope, confidence; also quarrelling, a plan that may fail, annoyance. The design is uncertain in its import, because the significations are widely at variance with each other. Additional meanings: Dark girl; a good card; it promises a country life after a competence has been secured. Reversed: Good advice, counsel, instruction, slander, babbling. Additional Meanings: Good advice, probably neglected. MATHERS: Hope, Confidence, Desire, Attempt, Wish. Reversed: Wise Advice, Good Counsel, Wisdom, Prudence, Circumspection. ETTEILLA: Hope, Expectation, Expect, Want, Promise Yourself, Brag, Essence, Design, Will, Desire, Wish, Longing, Craving, Liking, Fantasy. Reversed. Sage Advise, Good Counsel, Useful Warning, Instruction, Lesson.Observation, Reflection, Remark, Catching Sight Of, Thought.Reprimand, Slander.News, Announcement, Public Notice.Consultation, Admonishment. 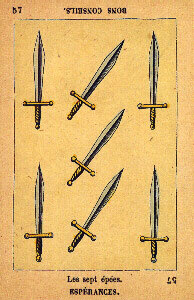 Illustration (above): Seven of Swords from Jeu de la Princesse Tarot (c. 1876), republished by Dusserre. Click the image for a larger one. WAITE: Journey by water, route, way, enjoy, commissionary, expedient. Additional Meanings: The voyage will be pleasant. Reversed: Declaration, confession, publicity; one account says that it is a proposal of love. Additional Meanings: Unfavourable issue of lawsuit. Reversed: Declaration, Love proposed, Revelation, Surprise. ETTEILLA: Road, Path, Lane, Walk, Passage, Footpath, RouteWalking, Trafficking, Canvassing, Thoughtfulness [the text reads: Prévenance; but if Provenance is meant, then the translation is: Provenance], Driving, Means, Manner, Way, Expedient, Voyage, Course, Stroll, Pattern, Tracks, Trace, Envoy, Commissionaire [Messenger]. Reversed: Declaration, Declaratory Act, Exposition, Discussion, Interpretation.Charter, Constitution, Diploma, Manifest Law, Ordinance.Publication, Proclamation, Conspicuousness, Public Notice, Publicity, Authenticity, Fame.Denunciation, Counting.Enumeration.Knowledge, Discovery, Exposure, Vision, Revelation, Apparition, Appearance, Admission, Confession, Protestation, Approval, Authorization. WAITE: Degradation, destruction, revocation, infamy, dishonour, loss, with the variants and analogues of these. Additional Meanings: An attack on the fortune of the Querent. Reversed: The same; burial and obsequies. Reversed: A sign of sorrow and mourning. Reversed: Losses, Trouble (same signification, whether reversed or not). ETTEILLA: Loss, Falsification, Waste, Degradation, Detriment, Decline, Destruction, Deterioration, Deprivation, Reduction, Injuries, Defeats, Prejudice, Wrong, Defect, Fault, Miserliness, Decline in Business, Damages, Disadvantage, Devastation, Squandering, Dissipation, Misfortune, Afflictions, Setback, Reversals of Fortune, Ruin, Downfall, Rout.Debauchery, Disgrace, Defamation, Dishonor, Vile Abuse, Infamy, Affront, Meanness, Deformity, Humiliation. Theft, Robbery, Abduction, Plagiarism, Kidnapping, Hideous, Horrible.Opprobrium, Corruption, Dissoluteness, Seduction, Licentiousness. Reversed: Mourning, Despondency, Ailment, Grief, Distress, Mental Suffering, Funeral Rites, Interment, Obsequies, Funerals, Inhumation, Sepulcher. WAITE: Vigilance, retreat, solitude, hermits repose, exile, tomb and coffin. It is these last that have suggested the design [see illustration, right]. Additional Meanings: A bad card, but if reversed a qualified success may be expected by wise administration of affairs. Reversed: Wise administration, circumspection, economy, avarice, precaution, testament. Additional Meanings: A certain success following wise administration. MATHERS: Solitude, Retreat, Abandonment, Solitary, Hermit. Reversed: Economy, Precaution, Regulation of Expenditure. 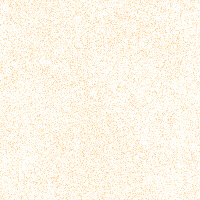 ETTEILLA: Solitude, Desert, Retreat, Hermitage.Exile, Banishment, Ostracism.Uninhabited, Remote, Abandoned, Given Up.Tomb, Sepulcher, Coffin. Reversed: Economy, Good Management, Wise Administration.Foresight, Direction, Household Management, Savings, Avarice.Order, Arrangement, Relationship, Agreement, Concord, Accord, Concordance, Harmony, Music, Disposal.Testament, Reserve, Limitation, Exception.Circumspection, Constituency, Discreet, Wisdom, Sympathy, Care, Precaution. 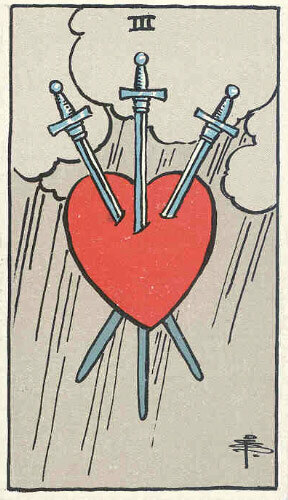 Illustration (above): Four of Swords, from an early edition (c. 1910) of The Rider Tarot Deck by Waite & Smith, first published by Rider in 1909 (from the private collection of Holly Voley). Click the image for a larger one. WAITE: Removal, absence, delay, division, rupture, dispersion, and all that the design signifies [see illustration, left] naturally, being too simple and obvious to call for specific enumeration. Additional Meanings: For a woman, the flight of her lover. Reversed: Mental alienation, error, loss, distraction, disorder, confusion. Additional Meanings: A meeting with one whom the Querent has compromised; also a nun. MATHERS: Nun, Separation, Removal, Rupture, Quarrel. Reversed: Error, Confusion, Misrule, Disorder. ETTEILLA: Estrangement [Removal], Departure, Absence, Gap, Dispersion, Remote, Delay.Scorn, Repugnance, Aversion, Hate, Disgust, Horror.Incompatibility, Annoyance, Opposition, Unsociableness, Misanthropy, Rudeness.Separation, Division, Rupture, Antipathy, Part, Cut. Reversed: Distraction, Insanity, Delerium, Mental Alienation [Derangement], Absent-Mindedness, Crazy Behavior.Error, Miscalculation, Loss, Detour, Gap, Dispersion. Illustration (above): Three of Swords, from an early edition (c. 1910) of The Rider Tarot Deck by Waite & Smith, first published published by Rider in 1909 (from the private collection of Holly Voley). Click the image for a larger one. WAITE: Conformity, and the equipoise which it suggests, courage, friendship, concord in a state of arms; another reading gives tenderness, affection, intimacy. The suggestion of harmony and other favourable readings must be considered in a qualified manner, as Swords generally are not symbolical of beneficent force in human affairs. Additional Meanings: Gifts for a lady, influential protection for a man in search of help. Reversed: Imposture, falsehood, duplicity, disloyalty. Additional Meanings: Dealings with rogues. MATHERS: Friendship, Valor, Firmness, Courage. Reversed: False Friends, Treachery, Lies. ETTEILLA: Friendship, Attachment, Affection, Tenderness, Kindness, Connection, Relationship, Similarity, Intimacy, Concord, Association, Interest, Conformity, Sympathy, Affinity, Attraction. Reversed: False, Falsehood, Lying, Imposture, Duplicity, Bad Faith, Roguery, Trickery, Treachery, Deception, Superficial, Superficiality, Surface. WAITE: Triumph, the excessive degree in everything, conquest, triumph of force. It is a card of great force, in love as well as in hatred. The crown [see illustration, left] may carry a much higher significance than comes usually within the sphere of fortune-telling. Additional Meanings: Great prosperity or great misery. Reversed: The same, but the results are disastrous; another account saysconception, childbirth, augmentation, multiplicity. Additional Meanings: Marriage broken off, for a woman, through her own imprudence. MATHERS: Triumph, Fecundity, Fertility, Prosperity. Reversed: Embarrassment, Foolish and Hopeless Love, Obstacle, Hindrance. ETTEILLA: Fructification, Extreme, Big, Excessive.Extravagant, Fierce, Carried Away.Exceedingly, Passionately, Inordinately.Vehemence, Animosity, Momentum, Excessiveness, Wrath, Fury, Rage.Extremity, Bounds, Border, Limits.Last Breath, Utmost Extremity.Quarrel. Reversed: Pregnancy, Beginning, Seed, Sperm, Matter, Impregnating, Fathering, Conception, Fructification, Labor, Childbirth.Fertilization, Growing, Formation.Expansion, Augmentation, Multiplicity. 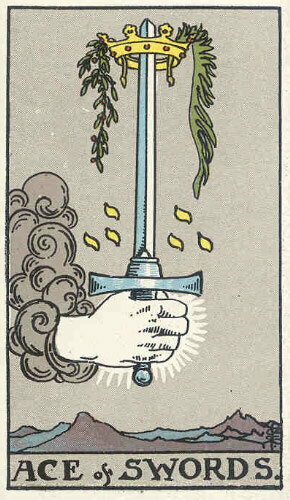 Illustration (above): Ace of Swords, from an early edition (c. 1910) of The Rider Tarot Deck by Waite & Smith, first published by Rider in 1909 (from the private collection of Holly Voley). Click the image for a larger one.